I've blogged about this topic almost more than 3 years ago how I used a couple of drupal modules to send mails with images from my iPhone which automatically got posted to my site. But times change. I now own a Nexus One and one of my goals for 2012 is to write at least one decent mobile application. I experimented with Titanium first, but decided to go native for a couple of reasons, performance and size of app being the main reasons. While I already have an official go for an application I can develop, I started with a simple use case to learn android application development: uploading images to my personal blog saving a new node. Especially the java part is as good as new to me, so starting simple is always the best advice. 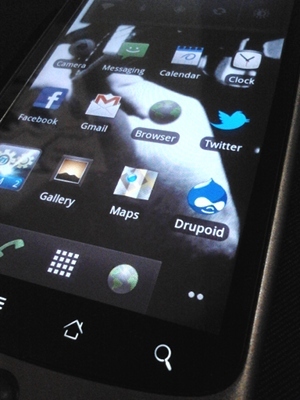 After 3 hours of Drupal hacking and a lot more Java reading and debugging, my first application is happily working on my own phone and I have cute Druplicon on my desktop. The code is freely available (see below) consisting of 2 parts. The application is build at SDK version 10, so it should work on any Android 2.3 or higher. It might possibly work on lower versions as well. After installation of the application and the first run on your telephone, you will need to login. The app authenticates with a Drupal user and only stores the endpoint URL and the session cookie. The session cookie is send when uploading an image so we know exactly who's uploading. Besides selecting from the app, you can also go to your Image gallery, select an image and use the Share menu to drop the image to the application. The endpoint. Defaults to 'drupapp', but you can change this to your likings. The image field name: this will immediately select the content type that will be used to save the node. Published status: default status, handy if you want to review after upload. Debug option: log the complete $_POST variable through watchdog for testing purposes. You will need to grant permission on the permissions page as well. Best practice is to create a new role which only has the "upload images via app" permission, and that role does not necessarily need a permission to create nodes. Combine the 2 technologies and you get Drupoid. What's in name right ? You can browse, fork and/or download the code at http://github.com/swentel/Drupoid. Feel free to modify it to your own needs. The app in its current version will never be made available on the Android market as it's really a personal project. But it might serve as a nice start example for your own adventures in mobile application land. You can also see some pictures from the screens at http://realize.be/mobile or an installation guide at http://www.slideshare.net/yoroy/drupoid.